I love your sweet balsamic vinaigrette and my Granddaughter, who is the most finicky eater I have ever known, loves it too. I buy 2 or three bottles at a time..
Met you in Westminster, Md and am so glad I did. We met today at the Arts and Crafts fair. (I'm the one from Lancaster, Pa.) I just wanted you to know that we had your dressing on our corn and black bean salad for dinner tonight and it was just fantastic! I'm so sorry that I didn't get the large bottle because I think that I will also use it to marinate chicken and chops for the grill! I just wanted you to know that it was really nice meeting you today and that we truly enjoyed our dinner thanks to you. (By the way, I do Weight Watchers, and it is only 6 Smart Points in case anyone ever asks. That's really good for a dressing that isn't light or fat free). > I will be headed to Stauffers of Kissel Hill as soon as we get home to stock up. > Thanks for your friendliness and your mindfulness in creating natural products that will become a staple in our home. There is positively nothing better! This past Friday (Good Friday) I bought my 1st bottle of Chef Tim's Vinaigrette. Have used it every day since. There is positively nothing better! Tomatoes, Basil & Mozzarella with this vinaigrette, it's heaven. Deon't forget the fresh baguette! We got a bottle yesterday at Penn Mac ! Indescribably great. You need to try it for yourself. Literally the most amazing thing ever. I tried it from a friend who bought this from PA's Chili Pepper Festival. Takes great with like anything, it's so insane because you will literally be addicted. I adore this on my salads, sandwiches, etc. 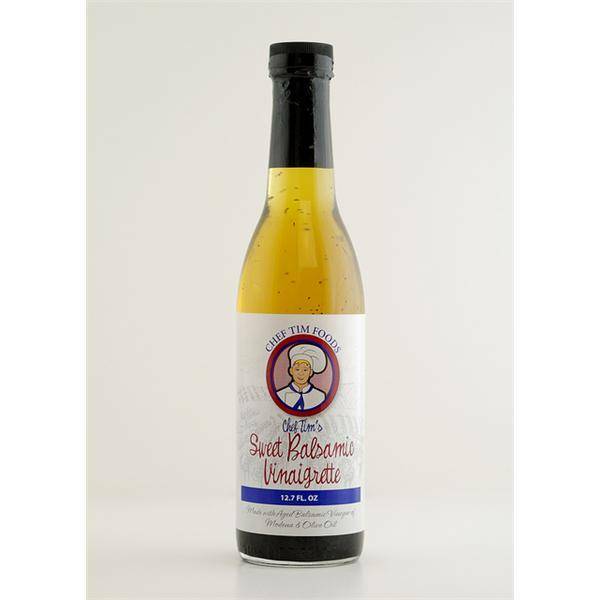 Chef - I sampled your sweet balsamic vinaigrette at Ft. Hunter last weekend and thought it was awesome. I had no money with me, but appreciated the tip to purchase at Karns.